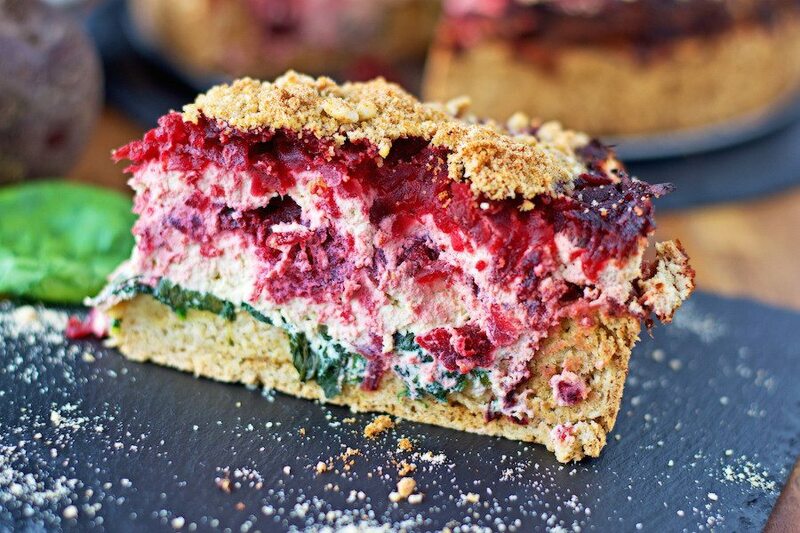 This vegan Beet and Spinach Tart is a baking addiction that you won’t be able to resist. Absolutely stunning, combining the flavors of the vegetables with an amazing homemade vegan Parmesan. This one will become an absolute staple in your house. I know I have been complaining a lot about a busy time with lots to do recently. Now, there was a change of pace with some holidays here and I used the long weekend to relax a bit. I was a bit surprised about myself that the idea of relaxing immediately sparked the desire to try my hand at cooking something challenging. Something that might take a couple of more steps than usual and something that I’m often struggling with a bit. Baking. That’s it. When there is one thing I’m usually not that good at, it’s baking. Sure, it comes out nicely most of the time but I still feel as if it takes a lot of effort. Still lots better than what I was able to do before I started my cooking journey, as you can read on About Contentedness Cooking. Other things just come much more naturally to me. In any case, I had bought these beautiful fresh beets and fresh spinach at the farmers’ market earlier and they were just teasing me to use them. Ok, this was the perfect opportunity to try my hands at a savory tart! It’s supposed to be full, rich, and beautiful! With lots of flavors combined layer by layer. And that’s how my Beet and Spinach Tart came into life. That is quite a job. So it had to be a gluten-free and vegan dough, first. This one I tackled very basic: a mix of buckwheat and oat flours, water, plant-based milk. But what about the layers? One with spinach, very briefly fried in olive oil with a bit of garlic, and one with cooked and grated beet root was a given. Both going on top of the crust. But can that be all? It seemed like something was missing. Yeah, I needed a third layer component separating the other two. Also, that layer needed to give the tart some extra firmness once baked. Cooked beet root and spinach alone are a bit soft and so the tart might have turned out somewhat floppy. I noticed before that a tofu-based filling does exactly that after baking. Taking a good amount of tofu, adding olive oil, garlic, vinegar, tamari, and some additional spices, running it through the blender, I was good to go. After putting down all the layers, one extra topped it off. A cashew parmesan made from cashews and nutritional yeast. After that, the blender was finally off the hook. I decided to add the cashew cheese after about half of the baking time so that it doesn’t burn. And here it is: My Beet and Spinach Tart. It tastes absolutely gorgeous and is very filling. It sustained me for a whole long weekend. Do you think it was worth the effort? Should I do more baking? 😉 Let me know on Facebook or Instagram with a tag. Cheers, Florian. Add all ingredients to a blender and process until smooth and creamy. Store cool. Grind the gluten-free oats to a flour, using a blender. In a large bowl, first add the dry ingredients, then water. Add milk bit by bit, mix and continue until the dough has a slightly sticky consistency. Use a blender to process all ingredients to a parmesan like texture. Bring slightly salted water to a boil and cook the beets for 45-60 minutes. Carefully check with a knife if they are done. Set aside. When cool, peel them and grate them coarsely. Use a colander to remove excess liquid. Heat olive oil in a skillet. Add the spinach and squeezed garlic. Fry for 2-3 minutes max. Preheat oven to 390°F (200° C). Prepare a round 10 in spring form either with parchment paper or with oil. Add the prepared dough and distribute it evenly so that it covering the bottom plus at least half of the side walls. Use a fork to make some hole into the dough. Then bake for about 15 minutes. Remove from the oven. Transfer the spinach to the spring form and cover the crust. Next add half of the tofu filling, followed by half of the beet root. Repeat. 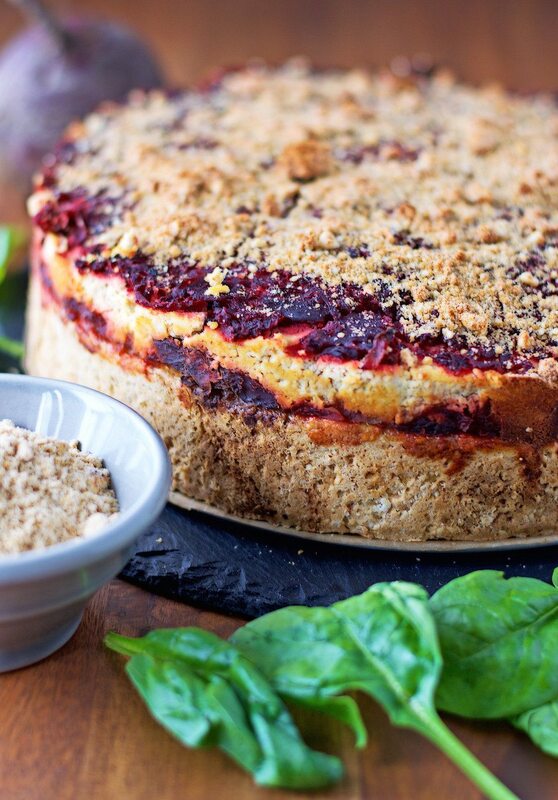 Bake the tart for 30 minutes, then add the cashew cheese on top. Continue baking for another 20-30 minutes. Well you certainly succeeded at baking this glorious tart!!! Awesome, Pam! Glad you like it! 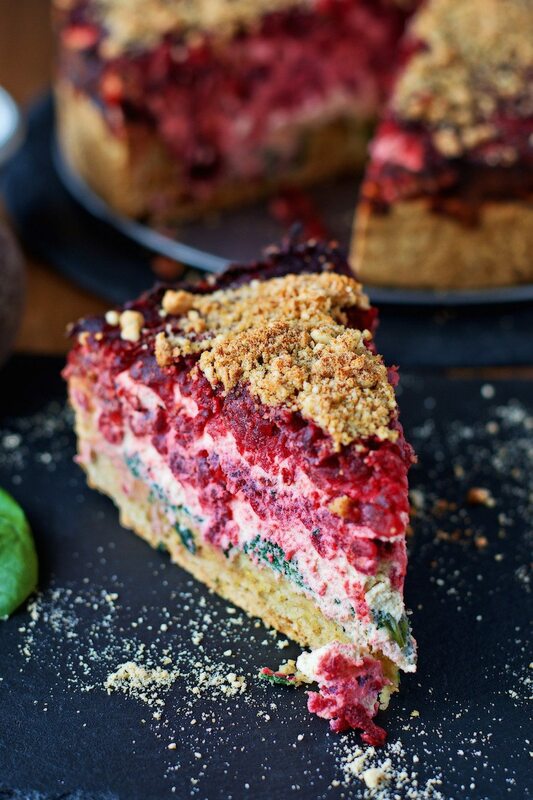 Wow – what a gorgeous tart! So unique and – being a huge fan of beets – so delicious! I love the uniqueness of this recipe not to mention how drop dead gorgeous it is. I know I would be a huge fan of the taste too. Thank you for the kind words! I hope you try it! This looks intriguing and the colors are so beautiful. Love beets & tofu, so can’t wait to give this a try! I hope you do, Debra! Let me know how it turns out. This looks like another date night gem Florian, with leftovers for breakfast 🙂 You did an amazing job. I’m quite the opposite though – I adore baking, but struggle with cooking at times! Haha, Date night food at its best. Glad you like it, Alisa! This is amazing, Florian. You are so talented! Well it might be a lot of work but it sure looks beautiful…and delicious! It is incredibly delicious, Judy! I hope you try it! This looks amazing! And I love the sound of the tofu “cream.” A perfect summer dish! wow, this looks absolutely amazing!! I might eat a beet! This tart is so stunning! Glad you like it, Michelle! I hope you give this a try! I’m pretty sure this tart is to your taste. Thank you so much, Becca! It is incredibly delicious. This is really beautiful, a masterpiece! Glad you like the tart, Tara! Wow, I love the look and all the flavors going on in this tart, Florian ! Glad you like the pictures and the recipe, Linda! Wow this looks impressive and yummy! I simply love this. Can I come over for dinner? OMG! This looks incredible and I can only imagine that it’s tastes even better! Great imagination and execution on this one, sir!! Thank you so much, Savannah! It is incredibly delicious and so tasty! 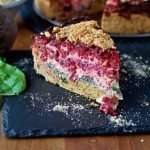 This beet and spinach tart looks amazing! What an interesting combination of flavors! SO pretty and so creative Florian and I’m in love with the cashew parmesan!! I need to try that! I love fresh spinach so much, so great addition! Wow, I look forward to trying this myself. The photography looks amazing and the food looks phenomenal. I am a sucker for healthy vegan meals. Glad you like the recipe and the pictures! I’m pretty sure this tart is to your taste! Can I take that delicious slice. please? Wow, I almost thought it was dessert as it looks so awesome and am sure it’s bursting with delicious flavors! Love it! Glad you like the recipe, Lorelai! Will have to check this out! Looks beautiful! And of course delicious! Very creative idea! Pinned! It’s a wonderful pie but…. Is there any way to replace the tofu with chickpea flour mix (as I have to for quiches)the amount please? Hi Pongodhall! I’ve never tried that before, but I would say stick to tofu whenever you can. Chickpea flour won’t work for the taste and texture. Let me know if you give this a try with chickpea flour. I’m curious about your experience.